Today, we are formally announcing the launch of WRPage (WebRank Page) our new initiative to make Search Engine Optimization easier. WRPage is our new service which allows you to make an in-depth analysis of your internal webpages to see what they are lacking in terms of SEO and in-general HTML structure, social reach as well as several other factors which we are going to lay out one-by-one. 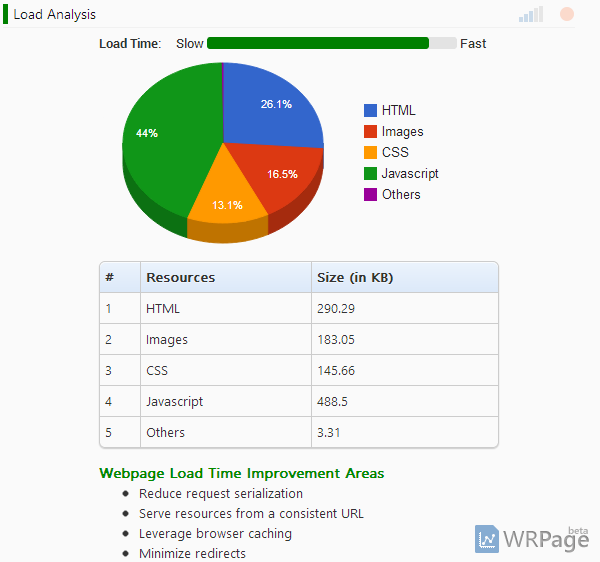 WRPage is a grading system which identifies the issues with your webpages and recommends solutions. Our grading system is completely based on real SEO parameters, there is no bias to your current standing. 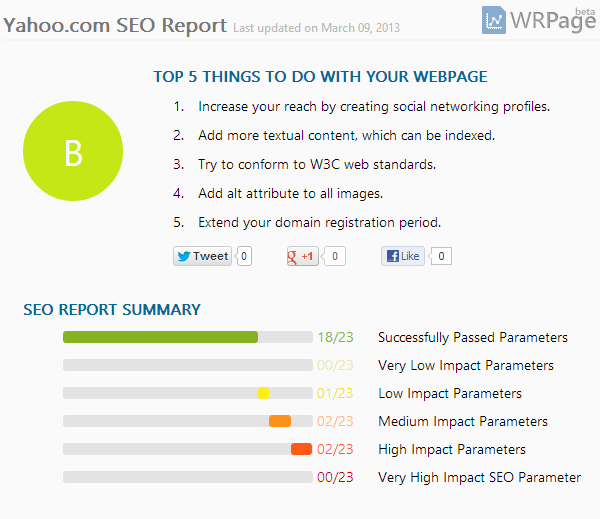 For the first time get a completely unbiased look at your and your competitors’ WRPage grade. We have implemented the new service from the ground up to give importance to particular parameters which affect your overall standing. We have characterized various parameters based on their impact in your search ranking, plus there is also an indication of you severe the issue is and therefore that it should be corrected soon. We have taken the example of Yahoo’s homepage to show you how our service works. 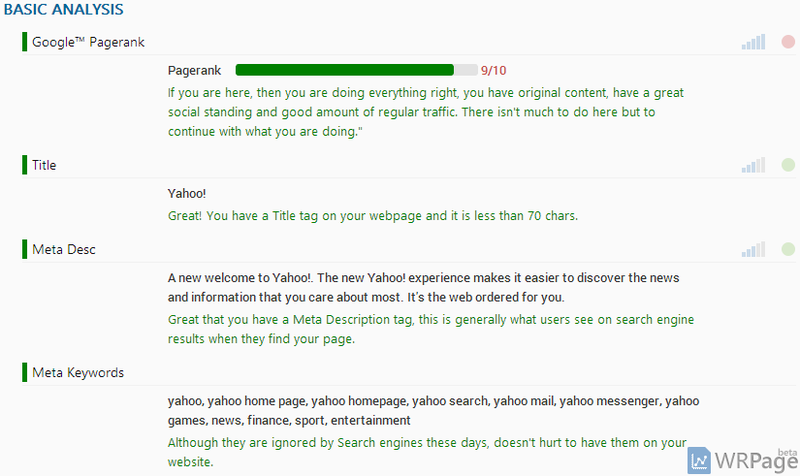 As you can see in the image above, Yahoo’s title tag is defined and is less than 70 characters therefore it has successfully passed this parameter and shown in green, with the explanation described above. On clicking this parameter you’ll be shown information and recommendation of what is a good practice for this particular parameter. On the right of the image you can see two icons, the first one is shows impact of this parameter on your real SEO grade, its on a reduced scale of 1-5 and then the dot represents the severity of the issue, using which you can determine when/if it needs to be fixed. Since we now have a foundation of the basic structure of the SEO report, let’s begin with the different sections we have covered to make your webpage stand better in terms of search engine ranking. This section of WRPage deals with the classic SEO parameters which have been become synonymous with Search Engine Optimization. But there’s a difference here, not only do we tell you whether your webpage passed/failed these parameters but also ways to fix it. Our recommendations make your webpage better. Some of the parameters in this section are PageRank, the Title tag, Meta tags, Encoding, Load Analysis of your webpage to check whether it loads quickly and what can be done to improve load time, GZip compression status and more. This is a thorough investigation of the structure of your webpage, where you can find if its the structure/design of your site that ‘s reducing your chances to be seen by search engines. Parameters here include the text/html ratio of the webpage which should be high so as to allow keyword rich data to be collected by Search Engines, use of Headings to give structure to your content (always advisable), use of alt attribute for images, Keywords used on your webpage and their frequency. In addition to this we also break the myth of using Flash and IFrames on your webpages, as well as W3C’s validation of your website to see the errors that are present in your webpage’s conformation to standards. You’ll discover issues here that you never thought your webpage had, and also get recommendations as to how to resolve these. The impact of Social sharing and content sharing is still being contemplated in search engine standing, but for those of us who understand it clearly, there is simply nothing as powerful as a successful social campaign which can immediately increase traffic to your website, however how you retain that traffic is upto your content and its quality. 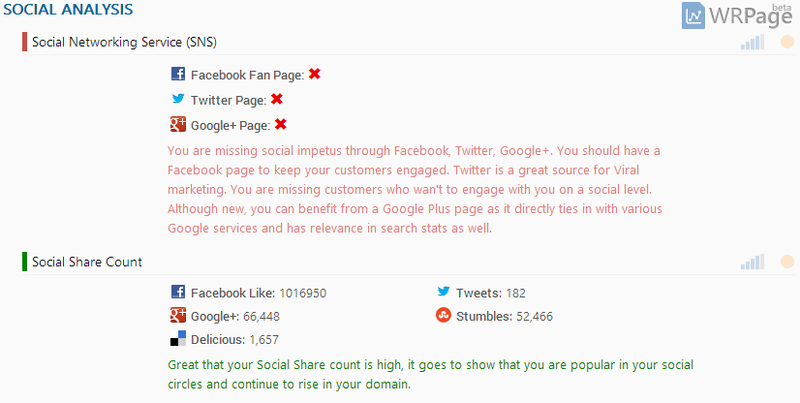 In this section of WRPage we show you the Social Networking profiles attached to your webpage as well as your social share count which aggregates information from Facebook, Twitter, Google+, StumbleUpon as well as Delicious. However, if we are unable to find social networking profiles of your website then nor would search engines, you should then increase the visibility of these profiles by including them in your header or main content and not be dynamically inserted after page load. Here we discuss the link analysis of your Webpage, the first parameter shown in this section is the ratio between Internal and External links and whether they are follow-able. You can also see both the Internal and External links on your webpage. Then we indicate whether your webpage is indexed in Google and Bing as well as whether your website is listed in the DMoz directory which also increases your chances of getting visibility in related searches. The demographic to which your website caters to as well as your intended audience is of prime importance both from a commercial standpoint as well as SEO. In this section we identify the Age group that uses your webpage the most, the gender of the majority of your viewers as well as country-wise distribution of your traffic. Website security has become paramount in today’s day and age where the security status of your webpage has a profound impact on your visitors. Users are becoming more informed day by day and with any service telling them that your website is unsafe will definitely result in loss of traffic. The WRPage analysis for this section will show you the security status of your website from various services, including McAfee, Norton, WOT as well as Google SafeBrowsing. We also find out if for some reason your website is listed as a spammer. 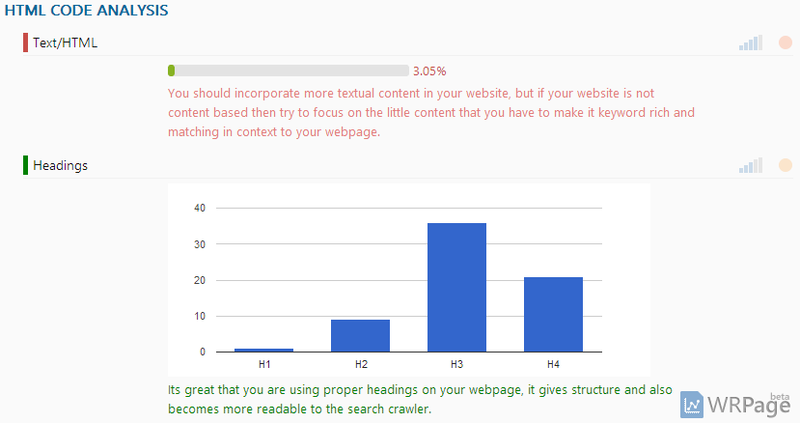 This section lists the miscellaneous parameters which do not impact your SEO grade but should be known to you. You can see whether your competitor is using Google Analytics, Google Adsense as well as what server technology they have applied. After we have determined all the parameters applicable to your webpage we begin with the evaluation of the data collected. The grading system at WRPage is based on a 9 point scale which is shown alphabetically as a grade according to parameters passed/failed by your webpage. We also list the top 5 things you should immediately do to improve your real SEO grade. Therefore, WRPage is a completely unbiased grading system with no outside influence or parameter, everything is right in front of you and you can see your grade improve after you fix the issues described in the report. The average grade which we have determined is C, while getting a B- or B states that there are very few issues and fixing the rest would yield very high results for you. As you familiarize yourself with the WRPage SEO report and its included recommendations, growth is imminent. This entry was posted in SEO News and tagged In-Page analysis, Page analysis, Search Engine Optimization, seo, SEO Advisor, SEO Tool, WebRank, WebRank Page, WebRankStats, WRPage by WebRankStats. Bookmark the permalink.